For the more than 20 years Don and Emily Sanderson have lived in their log home, they have been at war with carpenter bees. Efficient and precise, like any good carpenter, these bees (also known as boring bees) reappear each spring outside the Sanderson’s Northeast Ohio home and begin drilling nearly perfect half-inch holes into the wood. While homeowners of vinyl-sided homes need only worry about eaves and fascia, controlling carpenter bees in log homes is especially challenging. To a carpenter bee, a log home is the ideal target, with unpainted and weathered soft woods like redwood, pine, and cedar. Surprisingly, though, carpenter bees are not structurally or physically threatening (male carpenter bees have no stingers and females are usually docile). Destroying carpenter bee nests is difficult because of their location, but some new and old methods are effective. The females, on the other hand, could teach carpentry classes with their precision and reuse of material. Beginning work each April and May, females use their strong jaws to drill holes into the surface of the wood. Once the entrance is complete, the females make a sharp 90-degree turn and begin tunneling. These tunnels will continue anywhere from 1 foot to 4 feet until the females stop to carve out a nest. Carpenter bee nests are actually a series of small cells with walls made of chewed wood pulp in between. A female often creates six to 10 cells in a row along the main tunnel. At the end of this excavated gallery of cells she will leave a mixture of regurgitated nectar and pollen to feed her larvae. With her work complete, the female will die. The food ball is enough to keep the larvae fed through the growth cycle, around seven weeks. Sometime in August, the new adult carpenter bees will venture from the nest, only to return for hibernation through winter. The following spring the new generation of carpenter bees begin the life cycle again. The females will recycle the old nests, with some modifications, for their own larvae, sometimes for years at a time. Fresh sawdust along with drips of pollen and waste make tunnel entrances easy to spot. Also, expect to hear drilling sounds within the wood as the females work on their nests and tunnels. Ironically, the males are given the job of guarding the nests although they have no stingers. According to Tew, there is no universally accepted, good way to control carpenter bees, there are, however, many prevention methods. Owners of log homes must be extra-vigilant from the beginning. “It is best to coat the wood before the bees ‘find’ it because the next generation will return the following year to try again, and again, once the wood has been tunneled,” says Barbara Bloetscher, also an entomologist with Ohio State University. While wood stains will not deter carpenter bees, any exterior finishes with oil or polyurethane bases will help. Each spring, start early, plan on spraying the exterior of your log home with an insecticide. Obviously, because of the expanse of wood, this can be time-consuming. If, however, you decide to do the spraying yourself, look for insecticides with a pyrethroid as the active ingredient. This chemical is also known as bifenthrin, cyfluthrin, deltamethrin, and permethrin. Many pesticides can be purchased on the Internet in concentrated form. Most exterminators, for example, use a product known as Demand CS as a deterrent to carpenter bees. Demand CS is a microencapsulated pyrethroid containing the active ingredient lambda-cyhalothrin. Demand CS can be purchased in concentrated form with each 8 oz. bottle making 40 gallons of solution. The price for one bottle runs around $60. Some pesticides, like Demand CS, may require special licensing training or registration of the user in certain states. Make certain with your local extension agency, EPA office, or state list of registered pesticides before making any purchases. Some states will provide licenses and/or permits for personal use of registered pesticides for a nominal fee. Be careful what you purchase, though, pesticides with stomach poisons are useless against carpenter bees because the bees don’t actually eat the wood. In addition, pesticides can degrade in a matter of weeks or months making a reapplication necessary during the summer if carpenter bees are spotted. For spot treatment, anything labeled effective against bees and wasps will also deter carpenter bees. What do you do if these bees have already turned your home into their home? Carpenter bees give the expression, “It’s hard to find a good carpenter,” a whole new meaning. Some frustrated homeowners even resort to swatting carpenter bees with tennis or racquetball rackets. Bear in mind, female carpenter bees do have stingers and, although usually docile, they will attack if provoked. When treating wood for damage, wait until dark when the bees are less active and wear some protective clothing. Because the nests are vital to the bees year round, destroying these galleries gives the best chance at extermination, something easier said than done when nests lie within wood. Aside from burning down your house, which some homeowners consider after years of fighting this infestation, there are a variety of options when it comes to extermination. In the past, Borax was used as a common insecticide for carpenter bees. The disadvantage with this method, however, is length of time it takes to kill the bees. Borax, pumped into the entrance holes, works slowly, giving the bees time to cause more damage. For existing tunnels, insecticidal dust, like Sevin Dust, has been found to be the most effective. Again, look for a pyrethroid as the active ingredient and pump powder into the opening. Aerosol sprays can also be used in entrance holes. Wait a few days to allow the bees themselves to distribute the poison. Afterwards, plug the hole with a wood dowel coated in carpenter’s glue, caulking, or putty. Tew suggests using 0000 steel wool (4-0) dipped or sprayed with insecticide to close the entrance. This will cause the bee to chew on the steel wool for a while before escaping. The steel wool hole will need to be caulked over to prevent rusting as the wood degrades. Again, any contact with the burrow entrances should be done at night or early evening to assure the bees are inside and will not attack. For those disinclined to the use of pesticides, there are some common sense approaches to carpenter bee infestation. Some homeowners have found that waiting until winter to plug entrance holes with wood dowels to be most effective. Because the bees hibernate in the nests, they become trapped in spring when it’s time to emerge. Strangely, these bees are less inclined to bore out of wood rather than in. 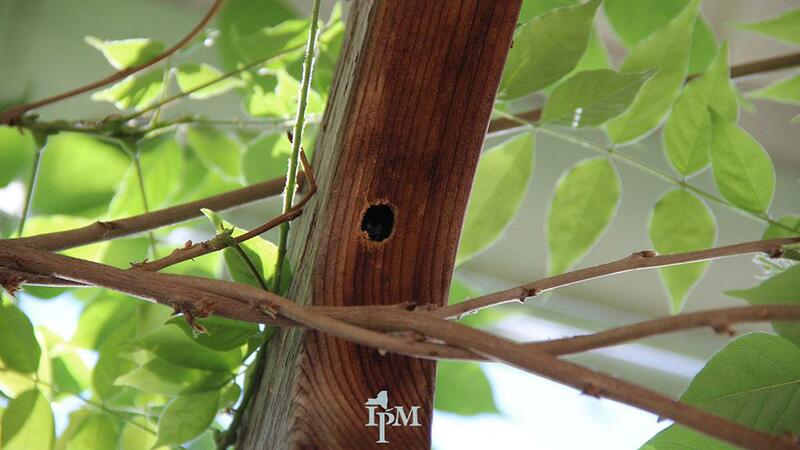 Others swear by the use of roofing nails, set in the entrance holes and covered with a caulking compound, this must be done in the fall after the new adults have left the nest, otherwise the bees will bore their way out. Taking a wire and inserting it far into the tunnels to destroy the nests is another alternative, although this requires the right timing and protective clothing to prevent stings. 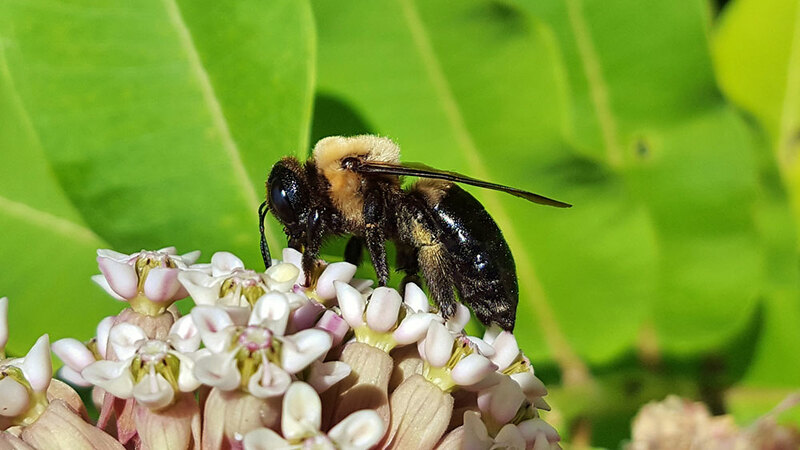 For more information on carpenter bees, contact your local university extension office or log onto Ohio State University’s carpenter bee fact sheet.